cancers. However, it has at least one basic shortcoming regarding its literature review. The authors confirmed the role of genetic risk factors and ionizing radiation exposures but claim that no firm conclusion could be drawn about the role of exposure to non-ionizing radiation, a new type of inescapable exposure which has been increased exponentially over the past decades. dence of glioma remained almost constant between 1979 and 2008 in all 4 countries”. GSM or CDMA signals for two-years. This study showed that when the intensity of radiation increased, the incidence of cancer among the rats also increased . This 25,000,000 USD study that is the most complex study completed by the NTP, showed that the occurrence of malignant gliomas in the brain and schwannomas of the heart, can be linked to exposure to mobile phone radio–frequency radiation (RFR) “The occurrences of two tumor types in male Harlan Sprague Dawley rats exposed to RFR, malignant gliomas in the brain and schwannomas of the heart, were considered of particular interest,and are the subject of this report”. It is worth noting that the NTP study is criticized for its possible flaws by some researchers. In this light we can even exclude this study and consider other studies which seem to be more valid. Bortkiewicz et al. have recently performed a meta-analysis and reported that their findings supported this hypothesis that long-term use of mobile phones was linked to increases risk of intracranial tumors . Another meta-analysis performed recently by Wang and Guo showed a signicant association between mobile phone use (> 5 years use) and the risk of glioma . Furthermore, Yakymenko et al. have previously reviewed the published data on carcinogenic effects of long term exposure to low intensity microwave radiation . They stated that there were reports indicating that exposure to low intensity microwave could lead to cancer progression in laboratory animals and humans. They also stated that the carcinogenic effect of these radiations was more prominent for long term exposures (> 10 years). There are scientists who believe that we cannot see the fingerprint of any increase in brain cancer incidence at population-level. They focus on this point that mobile phones were introduced 30 years ago and became ubiquitous 20 years ago or so. Therefore, we should be high on the shoulder of any brain cancer tempora lrisk distribution by now and if that risk were real and significant we should be able to see it, while we cannot. Based on the current evidence, it can be claimed that the fingerprint (increased brain cancers) is indeed visible now! “Mobile phone use has been increasing in Western, developed societies (de Vocht et al., 2011;Khurana et al., 2009) as well as worldwide (Khurana etal., 2009), and in parallel the incidence of certain types of brain cancers has also been increasing in the previous decades (Dobes et al., 2011; Zada et al., 2012)”  . 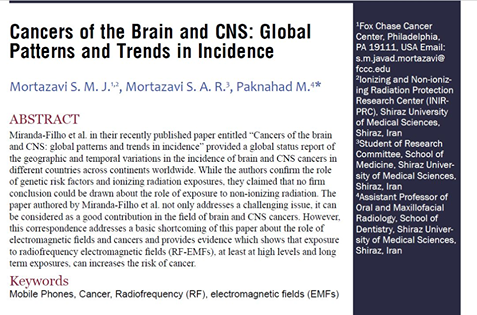 Moreover, EMF-induced cancers cannot be limited to brain and CNS cancers and other cancers (e.g. thyroid cancers) should be taken in to account “This study has shown an increasing incidence of thyroid cancer in Sweden and the Nordic countries. Better diagnostic imaging cannot solely account for the increase”… “Exposure to RF-EMFs also merits in-depth investigation.The design of our study does not permit conclusions regarding causality” . al patterns and trends in incidence. Neuro Oncol. Sprague Dawley® SD rats (Whole Body Exposure). Occup Med Environ Health. 2017;30:27-43. doi. between mobile phone use and glioma risk. J Cancer Res Ther. 2016;12:C298-C300. doi. and mobile communication systems. Exp Oncol. 6. Carlberg M, Koppel T, Ahonen M, Hardell L.
thetic controls. Environ Int. 2016;97:100-7. doi.